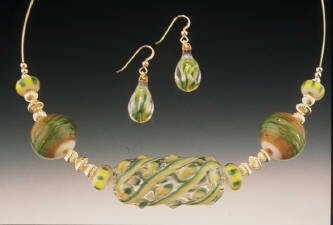 Michael Bell began lampworking in 1988. After apprenticing with the Warner family for several years, he set up his own studio in 1995. 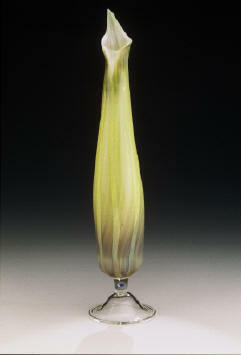 This move allowed for a greater flow of creativity and the opportunity to experiment with various techniques and types of glass. 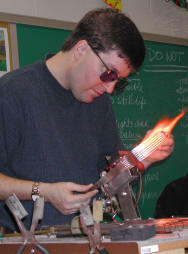 Michael has studied at workshops given by Harald Eberhart, master scientific glassblower at the University of Michigan; Bandhu Scott Dunham, author of Contemporary Lampworking: A Practical Guide to Shaping Glass in the Flame; and Robert Mickelson, a leading flamework artist and teacher. While Michael’s specialty remains sculpted hummingbird pieces, his diversity of forms include blown ornaments, vessels, beads and pendants. Danielle Bachant-Bell, who studied art as her undergraduate major, is not yet working in the flame. However, she has a strong influence and input on design and color choices, and is responsible for the design and finishing processes of all “wearable art” glass jewelry. Although commonly known as glassblowing or handblown glass, the historically accurate term for the craft is lampworking. This glassworking method from the thirteenth century used an oil lamp accelerated by a foot bellows to heat and shape glass. Flameworking is the modern term that best describes this technique. 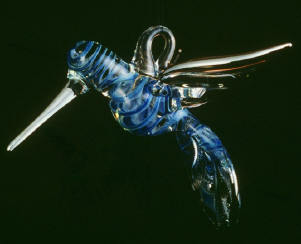 Pieces are made using borosilicate glass rod, tubing, and frit, formed in a propane and oxygen torch. Color is added to the work by a combination of traditonal Venetian and contemporary encasing techniques. Flame atmosphere and kiln processes also effect color change and finish. The finishing process for some pieces may include a kiln-fired luster or gold leaf, and all are kiln annealed for durability. Michael, a native of Muncie, Indiana, and Danielle, from Sautee-Nacoochee, Georgia, reside in Bloomington, Indiana, and work out of their home. In addition to the Brown County Craft Gallery, their work can be found at By Hand Gallery in Bloomington and at fine art and craft shows throughout the Midwest.